It doesn’t occur 9 to 5. It doesn’t have a schedule. Creativity rarely sticks around when I need it the most. Creativity loves to play games with my head. It keeps me awake at night when I would love to be sleeping. It lies dormant for days on end when I’m trying desperately to work on a project. Creativity likes to elude me. It hides and laughs at me from dark corners, it taunts me when I’m missing it so, it tells me I don’t deserve it in my life. But Creativity is also the best friend I have. Creativity whispers great ideas in my ear and gives me a tingly feeling when it wants to tell me I’m going in the right direction. Creativity can make me feel on top of the world at times. But then it will suddenly disappear and make me feel like a slug. What do I do when Creativity vanishes from my life? I leave my studio. I watch a movie. I read a book. I go for a walk. I meet someone for lunch. I chat with a friend over coffee. I look at magazines. I take a workshop. When I’m ready to coax Creativity to come out of its cave, I doodle. I turn on some music and open my art journal to any page and just start doodling. I begin with my favorite shapes and build on those. Line after line, circle after circle, heart after heart, Creativity envelops me once again and whispers in my ear: ideas, dreams, thoughts, and sparks of light. Dawn DeVries Sokol is the author of Art Doodle Love: A Journal of Self-Discovery and several other books on art journaling and doodling. 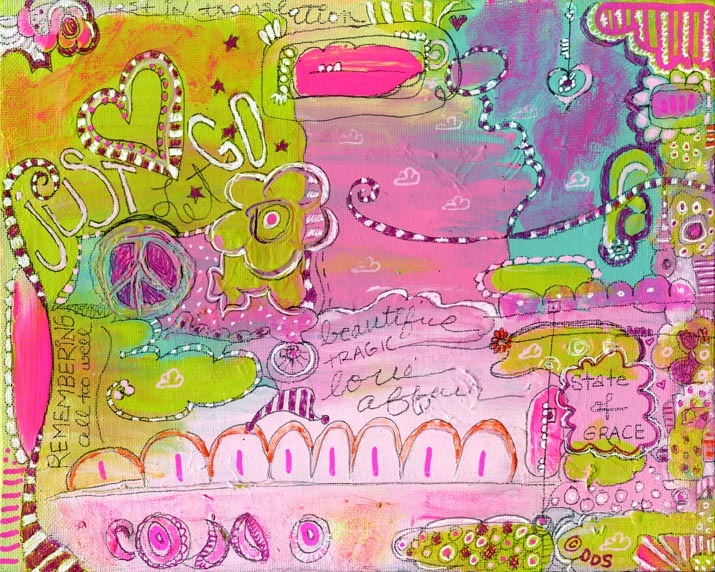 She teaches online doodling and art journaling workshops at www.dawndsokol.com.